Last week, Bob Greifeld of NASDAQ didn't exactly have a great day. The engine of his stock market sort of overheated on a hot August day and the stalled vehicle sat for a few hours before someone came to the rescue with the technological equivalent of radiator fluid. Instead of getting towed back to the shop for repairs, the electronic stock market managed to get back on the road. Hopefully, one of the pit crew chiefs will decide to have the thing brought in for inspection and a tune-up. SIDE BAR: For more details on NASDAQ's latest crash, read: "NASDAQ Crashes Yet Again But Will SEC Say Enough Is Enough?" (BrokeAndBroker.com, August 22, 2013). All in all, not a great day for NASDAQ or Greifeld or the company's public shareholders. Ya plunk down the big bucks for some high performance script and code and servers and the whole computer shebang and ya just don't expect to go from the soft purr of a high performance engine hitting on all pistons to the chug, clang, pop, fizz of a useless heap. Which brings to mind my Saturday afternoon this past weekend. I'm walking in the 60's on Madison Avenue in New York City and see this crowd of folks taking pictures and growing ever larger on the sidewalk. As I move closer, I see a delivery truck on the right, pulled over near the sidewalk; and I see a white car slightly ahead, also pulled over. There's a growing hubbub. It seems that the delivery truck for some produce company got in a fender bender with the white car. Some guy says that the white car was a French sports car made by Volkswagen, which doesn't make a hell of a lot of sense to me, but, hey, I live in Manhattan and don't own a car, so, who knows, maybe there is some French car made by VW. 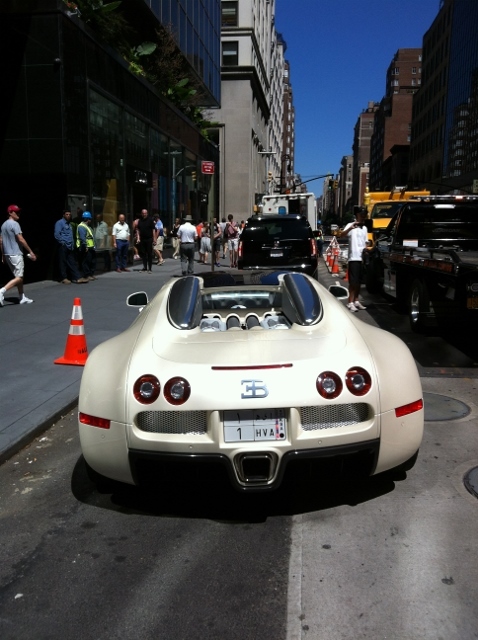 As the number of gawkers grows, I learn that the accident involves a Bugatti. I've heard of the car. About all that I know is it's expensive. Some guy in the crowd says the car is a few hundred thousand. Another guy says that's nuts -- that's a Bugatti Veyron and you can't buy one for under a million and a half he says -- some even go for twice that. It's the fastest car in the world. They hand make them. Then someone else says that the car is owned by some prince or some other big shot from Saudi Arabia. He says that the license plate has "KSA" on it, and that means "Kingdom of Saudi Arabia." 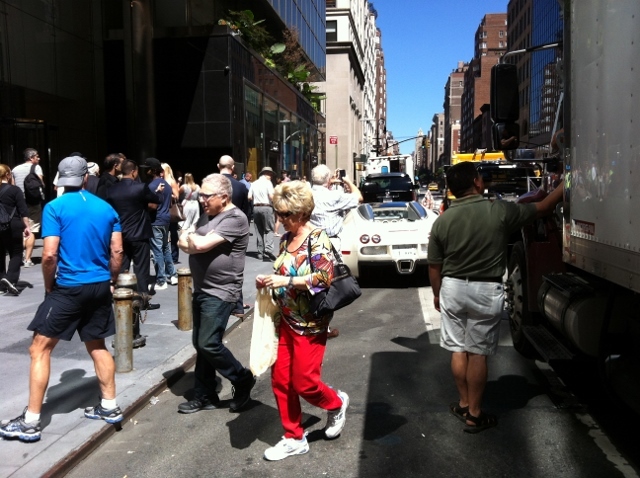 Okay, so , sure, it's a traffic accident scene on the streets of New York City, so who knows whether any of that's true. After a quick Internet search on my iPhone, I learned that Automobiles Ettore Bugatti was founded by Italian-born Ettore Bugatti in 1909 in the then German city of Molsheim, Alsace (which became French after World War I). The company struggled financially during the 1950s and was bought in the 1960s for its airplane parts business. In the 1990s, an Italian entrepreneur revived it as a builder of limited production exclusive sports cars, and, in fact, the company was acquired in 1998 by Volkswagen. The Veyron model is cited as the fastest street-legal production car in the world. As a lawyer, I like the idea of "street legal." In fact, I used to write a column called "Street Legal." Apparently, a Bugatti can hit something around 250 miles per hour, which is about the speed New Yorkers reach between the time it takes for a red traffic light to turn green. Not surprisingly, when a million dollar plus car with Saudi plates is in a fender bender, the police show up quickly, and a flatbed tow truck is already in place preparing to load up. The truck driver ain't looking none to happy. He may have a load of rapidly rotting cabbage and fruits and, on top of that, he apparently has hit one of the most expensive cars on the road -- or the car hit him, whatever. Regardless, try and explain that to the boss! I mean, wow, can you imagine when the fellow who owns the fruit and vegetable company whose truck got into it with a Bugatti Veyron gets a call from his insurance guy? Howsabout we call the unfortunate CEO of the grocery firm Murray. So, Murray likely walks in and picks up a message from his secretary that Manny was in a traffic accident on Saturday on Madison Avenue. Hit a car. No one was hurt. Minor front-end damage to the car. Manny sez it was the other guy's fault -- he was speeding in and out of traffic. Manny sez that he hit a VW Bug. The insurance guy gets Murray on the phone and tells him that the driver of the other vehicle wondered if they could settle this without bothering insurance companies. Murray says to the insurance guy that he has a cousin in the auto body business who could get an old front end from some VW Beetle and paint it up good as new -- let's do the deal. The insurance guy is momentarily silent -- he asks Murray what the hell he's talking about with the VW Beetle. Murray says that he was told that Manny said he got into it with a VW Beetle -- you know, the old VW Bug. 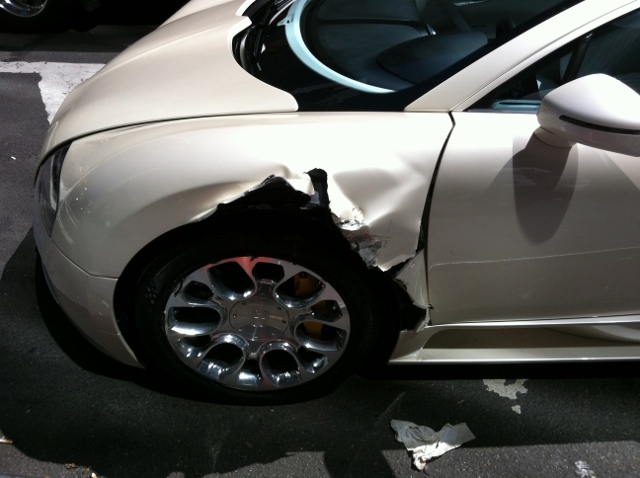 The insurance guy says that it's not a VW Beetle, it's a Bugatti. What the hell is a Bugatti, asks Murray. For starters, it's a million dollar plus car, the insurance guy explains. Are you kiddin' me, Murray asks but in far less polite language. No, I'm serious, it's a mil plus. For some friggin' VW bug? Murray, it ain't no VW like you're thinking. VW owns the company but this is like the most expensive and fastest thing on wheels. So what am I looking at to fix the front end, Murray asks. &dollar;24,000, give or take, the insurance guy says just before he hears the thud as Murray passes out and hits the floor. All of which brings me back to NASDAQ's crash the other day. Not exactly a delivery truck bangin' into or gettin' banged by a Bugatti Veyron. On the other hand, if you figure in the likely cost of repairs, don't forget that on May 29, 2013, the SEC fined NASDAQ about &dollar;10 million for the electronic exchange's prior May 18, 2012, NASDAQ/Facebook IPO crash. "This action against NASDAQ tells the tale of how poorly designed systems and hasty decision-making not only disrupted one of the largest IPOs in history, but produced serious and pervasive violations of fundamental rules governing our markets," said George S. Canellos, Co-Director of the SEC's Division of Enforcement. Daniel M. Hawke, Chief of the SEC Enforcement Division's Market Abuse Unit, added, "Our focus in this investigation was on the design limitation in NASDAQ's system and the exchange's decision-making after that limitation came to light. Too often in today's markets, systems disruptions are written off as mere technical 'glitches' when it's the design of the systems and the response of exchange officials that cause us the most concern." Funny, isn't it, how all that language about "poorly designed systems," "hasty decision-making," and "design limitation" sort of sounds like the forensic report from a traffic accident involving a high performance sports car. Of course, it took the SEC nearly a year to get around to fining NASDAQ for the 2012 crash, who knows how long it will take for this most recent August 22, 2013, one -- you know, the crash that occurred less than three months after the SEC imposed upon NASDAQ the biggest fine in the history of mankind. So much for letting 'em off with a warning. Don't expect the SEC to move nearly as fast as a Bugatti Veyron. After all, Knight Capital got into a fender bender with the New York Stock Exchange on August 1, 2012, and, gee, I don't think the SEC has announced a settlement or a trial date yet. I'm just tossing this idea out there but maybe the SEC could go back to the folks at Knight Capital and also put in a call to NASDAQ and suggest something really novel. Instead of paying more fines to the SEC, how about the two firms pitch in and buy each of the four SEC commissioners and the Chair a Bugatti Veyron? What's that gonna cost anyway -- maybe &dollar;7.5 to &dollar;10 million? That would at least equal the SEC's May 29th record fine.